This is a guide to the things that matter most when buying an engagement ring and how to get it right, first time. We can give you tips, when looking for that special ring. Guiding you through the choices of quality, style, and what women like. So you’ve decided to take the plunge. But you don’t know where to start when it comes to THE RING. Buying an engagement ring and the problems that it can pose, can be dealt with more easily, by working through this list of questions. How you answer them, should help you to hone down on the decisions that you make. This can be a tricky question, but it will determine so many of the following questions, that you should probably start here. The standard ‘DeBeers’ answer to this, is one to two months’ salary. However, it’s not a hard and fast rule that has to be stuck to. You should balance what you can afford, (without long term damage to your wallet), against your partner’s likely expectations and aspirations. Remember that you are making a statement, as much about your wealth and generosity, as you are about your declaration of love and commitment. This is likely to be a ring that will be worn for many years to come and as you mature and (hopefully) prosper, a ‘generous’ purchase today, may appear much more ‘ modest’ in years to come. From a poll of clients we asked, about 79% of women, confided that they’d much rather their fiancés spent more on the ring, than on the place or manner of proposal. This doesn’t mean that you should skimp on everything else, but once the romantic weekend is over, she’ll still be wearing the ring. My advice would be, to spend just that little bit more than you originally had in mind. Push the boat out, and wait for the expression on her face, when she sees the ring! The ‘surprise route’ or the ‘let her choose’ route? This is something that only you can decide. It’s dependent upon your own ideals, of how you imagine your proposal scenario to play out. Plus any expectations your partner might have, regarding the ring. Try asking yourself some of these questions. Do you envisage ‘popping the question’ and presenting a ring simultaneously? Do you think you know her tastes well enough to choose something she’ll like? Look at the kind of jewellery that she currently wears, to gauge whether she’d like an extravagant design, or something lower-key. If she wears no jewellery at all, then a more subtle approach would probably be more appropriate. Ask yourself if she prefers modern or traditional styles? Does she like white or yellow metal? Answer these questions and you’ll be some way towards defining what may be right. Whilst you may think that you have no idea what she’d like, if you eliminate some of the above choices, you may be closer to your answer, than you first thought. Is she likely to enjoy your ‘surprise’ or would she prefer to choose something with you; e.g. a more shared experience? Many ladies love the thought of planning these moments together. You can discuss whether to make the ring in platinum or gold and choose from a selection of loose gems, ensuring that you’re both happy with the decisions. Some of our couples pencil ideas down, before they come to us. Others have shared interests or passions that they’d like featuring in the design. Occasionally people give us photos or mood-boards to help us to hone in on tastes. Any hints like this will help us to guide you in what’s right and what’s not. Alternatively, we can just sketch ideas whilst you’re with us; showing you loose stones and discussing setting styles, to help you to decide. Would you prefer her to be wearing something of your own choice? If you have a clear idea of the ring you want her to wear, that’s fine too. About 15% of our male clients have very firm ideas when it comes to the style of ring they’d like their partner to wear; be it type of gem, number of stones or type of metal used. After-all, it is your announcement to them, of your devotion, so your choice is perfectly permissible. Have you thought about the wedding ring that it will be worn with? I know this may feel a million miles away and therefore unrelated to the first ring; however, the shape of the engagement ring could have a bearing on the shape & design of the wedding band. An engagement ring with a large cluster head, or fancy shaped stone, may not sit well against a flat, parallel wedding band. So think about this, as you may need to go for the option of a tailored wedding ring, to ensure the two rings look good together in the future. 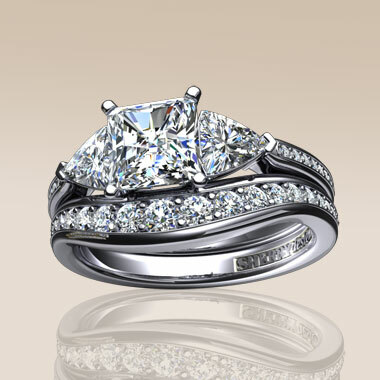 If we design and make your rings for you, we can create styles that look unified and harmonious together. All of our designs are all kept on record, ensuring that the two rings can be sympathetically styled to one another, even if they are created a few years apart. If you need the rings to slot into each other, you’ll have the advantage of designs fitting perfectly together too. Are you completely stumped by the whole prospect? A blunt question perhaps, but we still have the solution for you. A growing number of men come to us, to buy the loose diamond, on its own. We can give you a choice of size, quality and cost, from which you can choose the perfect stone. You then present the gem, as a surprise and explain that you have arranged for you both to come to our studio, to have the ring designed together. This ticks all the boxes. You have been able to surprise her, whilst ensuring that she gets exactly what she wants! Another way to tackle this is to leave it to us. I will ask you about the recipient, to get a profile of her tastes, honing in on the information that you can provide, to narrow down the choices. Through a series of sketches, then with a computer generated image, you’ll be presented with a photographic image of a proposed design. We have worked using this method, with huge success on many occasions. We can take any worries you might have, out of process for you. My candid advice would just be, don’t! I know you might expect me to say this, but take my word for it. So many times, we see customers who have either bought very low-grade or treated gem stones. Or poorly cut diamonds, sold at highly inflated prices, believing them to be far better than they are. Even worse, some have been duped by fakes, which turn out to be worthless. The old saying of, ‘if something seems too good to be true; it probably is’ should be remembered and adhered to. There’s so much less ability for ‘come-back’ when you’re buying in another country too. Buying from a company with an established track record, who can offer advice, experience and service will far out-weigh any prospect of a ‘take your chances’ bargain. When you buy from us, we will offer you a range of loose stones to choose from. This way you’re able to compare one against another. This will help you to see and understand the different characteristics between each individual gem.Involvement to this extent, assures you, that the choices you make, are the right ones and that your expectations will be met. We have a wealth of experience, designing and making bespoke jewellery, for over 25 years. Over that time, our company has made for thousands of happy customers, including a number of household names. Our personal approach and excellent service, ensure satisfaction for every client. You may be concerned that you wouldn’t know what you were looking at. This is quite a common concern. But you’re likely to surprise yourself, picking up on the tangible differences that you really will be able to see. Plus, we are always there, to guide and advise you too; offering candid, but sound advice, when it is asked for. Remember, as well as The 4 Cs, the actual fabric of the diamond crystal should be looked at. By this, I mean the composition of the crystallised carbon. Whilst on paper, a certificated diamond may have all the right qualities; it may still be cut from really poor base material, which has little life, sparkle and zest. A case in point, was a customer, who decided to buy a ‘D’ colour ‘Flawless’ loose diamond off the internet. Whilst it was a totally genuine stone, it was very lifeless to look at; a really poor diamond. When he bought it to us, to have it mounted, he was somewhat disappointed, when he compared it with the material we could have offered him. Where at all possible, try to choose from a selection of un-set diamonds, in natural daylight conditions, when deciding on your stones. The jury is out on this one! It’s an age-old question and one that will be answered differently, depending who you ask. We have clients in both camps. Some of whom, always insist on perfection over size. Others want a rock that will take your eye out; more ‘bling’ for your buck. Compromising somewhere in the middle, is the usual route. Perhaps a decent enough size, to be able to see (half a carat upwards) Plus, bear in mind, that a good white colour is more immediately visible across a room, than a slight flaw within the diamond. So perhaps choose a good colour, over clarity. If you have the budget, that enables you to maintain quality, whilst achieving size, then this section isn’t going to be an issue for you. Approximate diameter sizes, equivalent to carat weight. This might be of help, so you don’t feel out-of-your-depth, regarding carat weight. Hopefully you’ll be able to envisage the diameter of the diamond/s. With luck, you may have found some of this advice on buying an engagement ring useful. We’re always willing to offer our help and expertise. We have been making bespoke engagement rings for over 25 years, to great success. Enjoy the process if you can, as this is one of those ‘key moments’ in your life.